When soldier Li Dingyong crawled into a tour bus that had been battered by falling rocks, he was saddened to find the bodies of two tourists. 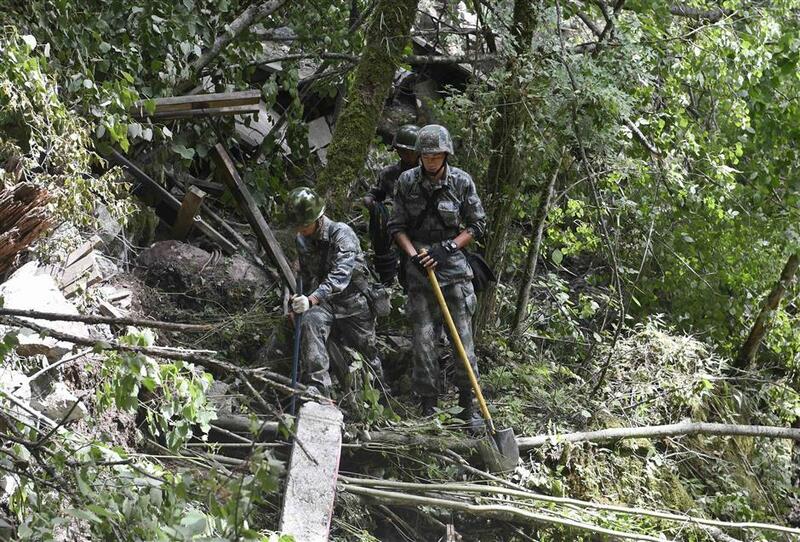 Soldiers search an area for anyone trapped after the earthquake in Jiuzhaigou County in Sichuan Province yesterday. Tuesday’s deadly earthquake turned what was supposed to be a joyful night for tourists in a remote summer hideaway into a nightmare. After the earthquake struck, Li, 30, and his fellow soldiers were told to clear the highway, save the injured and search for missing people and vehicles along the 301 Provincial Highway which connects the Jiuzhaigou tourist area and Huanglong Jiuzhai Airport. As slabs of rocks and loads of dirt continued to fall on the highway, Li and 19 fellow soldiers decided to walk and continue rescue work using their bare hands and several flashlights. “We saw about 40 tourists near a tourist village not far from the highway, some of them injured, and we brought them to safety,” Li said. At the most clogged section of the highway, rocks and dirt formed a huge mass of around 10,000 square meters, Li said. “When fewer rocks and less dirt fell, the soldiers just covered each other and ran quickly over the area through all the dust,” he said. Li and others spent the night walking back and forth to transport tourists and clear the highway. He said he walked a distance of about 60 kilometers. When they finally reached the tourist site, it was already 11am on Wednesday. Like Li, Ma Ti was also tasked with transporting tourists stuck near the highway. Ma, 33, said he was among 80 soldiers sent to assist with relief efforts. “We saw more than 150 tourists stuck in a forest near the highway on Wednesday, two of them severely injured,” Ma recalled. As the quake cut telecommunications, the tourists were unable to contact the outside world and were overwhelmed by anxiety, hunger and exhaustion. Eventually, the soldiers decided to transport them to a transfer area through the piles of rocks and dirt. One tourist said: “I just feel very grateful to our soldiers.